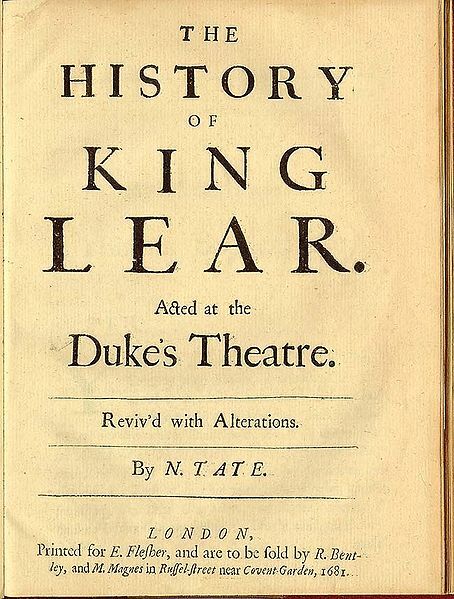 "'Tis more difficult to Save than 'tis to Kill"
Nahum Tate’s 1681 adaptation of King Lear is somewhat infamous among Shakespeare scholars and enthusiasts. This 1681 revision turns the tragedy into a history, eliminates the King of France in order to manufacture a love story between Cordelia and Edgar, gives Edmund nefarious sexual intentions (as though he didn’t have enough of those already), restores Lear to his throne, and drops the Fool from the play entirely. Preparing Tate’s Lear for our Staged Reading series has gotten me thinking about this play’s tattered reputation — is the ridicule and mockery really so deserved? I think a little historical perspective here helps. I’m always surprised to remember that this was such an early adaptation, since the constructed happy ending smacks so much of the Bowdlerization of the Victorian era. The Restoration, though, had plenty of its own theatrical quirks. Parliament had closed the theatres in 1642, objecting to them on the grounds that they propagated vice and deception (after all, what do actors do besides stand up there and lie about who they are for two hours?). The playhouses would not re-open until Charles II’s reclaiming of the throne in 1660. Thereafter, the most popular plays were comedies featuring witty lovers, and considering the restrictive and culturally confined atmosphere that England was rising out of, this is hardly a surprising preference. Restoration theatres did revive Shakespeare’s plays, but judging by Samuel Pepys’s Diaries, a series of social observations written throughout the 1660s, companies favored his comedies over his tragedies, and by the latter part of Charles II’s reign, plays by new authors increasingly crowded out the pre-Cromwellian offerings. Shakespeare was not viewed in such rarefied fashion as he is now, but simply as one of many playwrights whose works had merit, but wanted revision in order to suit the tastes of new audiences, nearly a century removed from the original staging of the plays. You have a natural Right to this Piece, since, by your Advice, I attempted the Revival of it with Alterations. Nothing but the Power of your Perswasion, and my Zeal for all the Remains of Shakespear, cou’d have wrought me to so bold an Undertaking. […] ‘Twas my good Fortune to light on one Expedient to rectifie what was wanting in the Regularity and Probability of the Tale, which was to run through the whole A Love betwixt Edgar and Cordelia, that never chang’d word with each other in the Original. This renders Cordelia‘s Indifference and her Father’s Passion in the first Scene probable. It likewise gives Countenance to Edgar‘s Disguise, making that a generous Design that was before a poor Shift to save his Life. The Distress of the Story is evidently heightned by it; and it particularly gave Occasion of a New Scene or Two, of more Success (perhaps) than Merit. This Method necessarily threw me on making the Tale conclude in a Success to the innocent distrest Persons: Otherwise I must have incumbred the Stage with dead Bodies, which Conduct makes many Tragedies conclude with unseasonable Jests. Yet was I Rackt with no small Fears for so bold a Change, till I found it well receiv’d by my Audience; and if this will not satisfie the Reader, I can produce an Authority that questionless will. Neither is it of so Trivial an Undertaking to make a Tragedy end happily, for ’tis more difficult to Save than ’tis to Kill: The Dagger and Cup of Poyson are alwaies in Readiness; but to bring the Action to the last Extremity, and then by probable Means to recover All, will require the Art and Judgment of a Writer, and cost him many a Pang in the Performance. Tate’s revisions played up to what Restoration audiences wanted to see — love triumphant, and a monarch rightfully restored to his throne. It’s also well worth noting that Tate’s adaptation was wildly popular — so much so that it virtually replaced the original Lear until well into the 19th century. 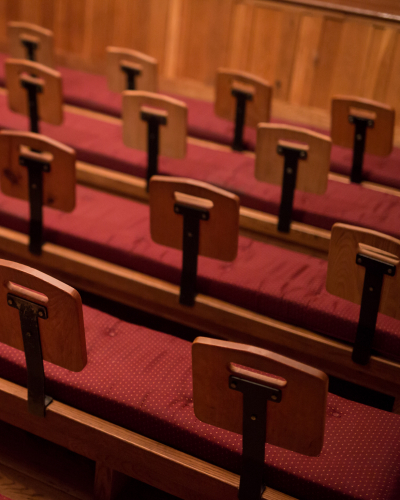 From the 1740s on, various productions would add back some Shakespeare or contribute more new material, but it wasn’t until 1823 that a company dared perform the original Shakesepare — and then, it wasn’t well-received. Only towards the end of the Victorian era did the early modern version of the play re-assume its dominance. The biggest problem for Tate, ultimately, isn’t that he altered the story — it’s that he kept so much of the original. Placing his verse alongside of Shakespeare’s necessitates comparison, and that doesn’t work out well in Tate’s favor from a critical perspective, though audiences across three centuries enjoyed it anyway. Indeed, the internecine clash between scholars and practitioners may well date to Tate, as he received criticism from the onset for altering Shakespeare’s verse, for undercutting the tragedy of Lear’s death, for weakening Cordelia’s character by burdening her with a love story, and for the overall sentimentality of the piece. Ironically for those critics who cry for authenticity, Tate’s Lear is actually closer in some regards to the original story of Leir from Geoffrey of Monmouth’s Historia Regum Brittaniae, where the king does defeat Goneril and Regan to recover his throne. He rules for three years until his death, at which point Cordelia takes the crown. Cordelia would, in turn, be overthrown by her nephews, the grown sons of her deceased sisters, who would divide the kingdom between themselves before devolving into civil war (profitable ground for a sequel, in my opinion). So, does Tate deserve the mockery of the modern age? Or has history unfairly maligned him? In a few weeks, you can decide for yourself if the play has, as Tate himself allowed, “perhaps more success than merit”. The Staged Reading of The History of King Lear, Reviv’d with Alterations by Nahum Tate will take the stage of the Blackfriars Playhouse on March 16th at 7:30pm.